Note: I applied this polish on February 19th and took the photos on the 20th. These photos were taken with my camera (normally I use my phone). I am a huge NASCAR fan and since last year, I have done a Daytona 500 mani. My favorite driver is Jeff Gordon so I knew I wanted to do his car colors. 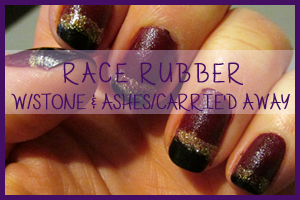 I chose 'Race Rubber' from Sinful Colors for both the color and the name (totally perfect). 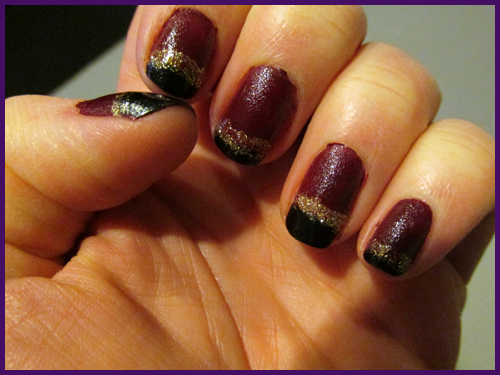 'Smoke & Ashes' from China Glaze (again, perfect). I ended up using 'Carrie'd Away' from Nicole to kind of accent it in between the colors plus Jeff's car has yellow. Race Rubber was a one coater and it dried really well for a Sinful brand polish. It finishes with a bit of a texture and it would have looked good on its own. I really wanted to do all of the colors. I tried to put the black (which has some glitter in it) as the tops but without a steady hand, some fingers looked a hot mess. So I did one coat of that and then used a nail brush to paint on the Carrie'd Away. Overall I am giving this mani a 5 out of 6 stars. It is one of those manis where you aren't so sure if you love it or not but I ended up really loving it after about 2 days.